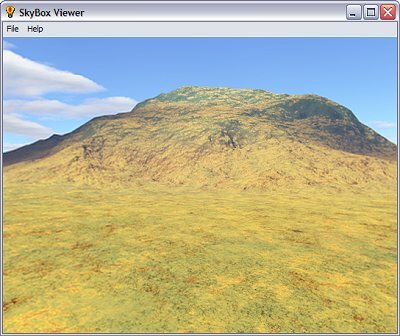 Once you have successfully created a .bisb file with the SkyBox Stuffer, all you need to do is run the Viewer, select 'File/Open' and open the file. Pressing the 'Escape' key will bring up a little dialog box that will allow you to toggle between windowed and full-screen modes. We've made two .bisb file available for download so you can see how it's supposed to work. It's not particularly high resolution; nonetheless, click here to download a pair of skyboxes, including one inspired by the Laramie Range in Southeast Wyoming, shown here on this page, (.zip, 3.5 MB).